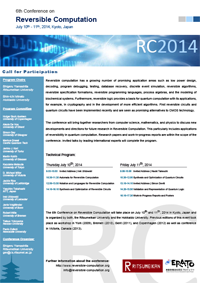 The 6th Conference on Reversible Computation will take place on July 10th and 11th, 2014 in Kyoto, Japan and is organized by Ritsumeikan University, Hokkaido University, and JST ERATO Minato Discrete Structure Manipulation System Project. Interested researchers are invited to submit full research papers (12 pages maximum) as well as tutorial, work-in-progress, or demonstration papers (6 pages maximum). All accepted papers will be published in Springer's Lecture Notes in Computer Science (LNCS).